Melbourne: Bringing back memories of the tragic death of Philip Hughes in November 2014, an Australian cricketer Daniel Hughes was left unconscious briefly after being hit by an almost identical bouncer on his neck during a first grade match but fortunately escaped unscathed, local media reported on Sunday. Batting for Northern Districts against Blacktown at Mark Taylor Oval in Sydney, Daniel attempted a hook shot off a bouncer from bowler Cameron Nupier but the delivery hit him on the back of his neck, underneath his cricket helmet and he was rushed to the Hornsby hospital. 25-year-old Daniel, a promising batsman who also plays in the Big Bash for Sydney Thunder, dropped his hands onto his knees as concerned opposition and teammates raced to his aid. The impact of the delivery "left a lump on the side of Daniel's head of the size of a cricket ball" but after several tests and CT scans, he was cleared of any major damage and discharged from the hospital. Read: Is it the end of Craig Kieswetter's career? The impact of the ball on Daniel's neck was just millimeters from the same main artery which killed Phillip Hughes, a report in 'Herald Sun' said. "His neck was swelling up and we thought 'oh God'," Northern Districts president Mike Langford was quoted as saying by the report. Play was suspended until Daniel was assisted from the pitch and an ambulance called. 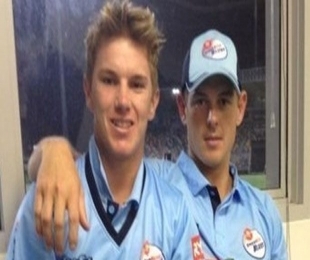 Daniel's girlfriend Erin Molan said that he played junior cricket with Philip. "He (Daniel) has got the lump on the side of his head the size of a cricket ball, it's horrendous. I don't think I've ever been so scared in my life," Daniel's girlfriend Erin Molan said. "It's unbelievable and given their same surname (Hughes) it's quite terrifying. Daniel played a lot of cricket growing up with Phil through the juniors. We're all just glad he's OK," she said. Philip died in November last year after being hit on the neck during a domestic Sheffield Shield match at the SCG just before the start of India's Test tour of Australia, plunging the cricketing world to a state of shock.